Additional Info: The Kantan Chamorro style of singing has been a favorite form of entertainment for generations. One singer would begin the familiar four-line chant, referring romantically or teasingly in the verse to another person in the group. The challenged person would then take up the tune and the song might continue in this fashion with different singers for hours. Just 30 miles long and less than 9 miles wide, Guam is the largest of Micronesia's islands and is a very interesting place to visit even without checking out its amazing scuba diving and other water sports. The Chamorros, Guam's indigenous inhabitants, first populated the island approximately 4,000 years ago. The Chamorro people or Chamoru people are the indigenous people of the Mariana Islands, which include the American territory of Guam and the United States Commonwealth of the Northern Mariana Islands in Micronesia. Traditional Chamorro culture is visually manifested in dance, sea navigation, unique cuisine, fishing, games (such as batu, chonka, estuleks, and bayogu), songs and fashion influenced by the immigration of peoples from other lands. Guam, an island in the Western Pacific Ocean and an organized unincorporated territory of the United States, is a popular vacation spot for scuba divers. As a vacation spot for scuba divers, efforts have been made to protect Guam's coral reef habitats from pollution, eroded silt, and overfishing that have led to decreased fish populations. In recent years the Department of Agriculture, Division of Aquatic and Wildlife Resources has established several new marine preserves where fish populations are monitored by biologists. Tumon Bay has now been made into a preserve. A federal Guam National Wildlife Refuge in northern Guam protects the decimated sea turtle population in addition to a small colony of Mariana fruit bats. Guam has some of the best dive sites in the world since there has been minimal tourist impact compared to other better known dive locations. Piti Bomb Holes has been built up as a tourist attraction allowing tourists to descend into an observatory where they can take in the beauty that has grown in a sinkhole. Divers may dive around this attraction and feed swarms of fish for the amusement of the tourists inside the subaquatic observatory as much as for the divers' own amusement. Guam waters maintain a temperature of 82-86 deg F year round with excellent visibility at most locations. Guam is a great place to visit any time of the year: the rainy season, if you can call it that, is generally from September to December. This means that there are bursts of rain and sun throughout the day. The windiest months are between January and early April as the tropical northeast trade winds are active. The calmest months are between April and August, but since virtually all of the diving is on leeward (west) side of Guam just about all of the sites are available all the time. There are quite a few sites around the island that offer very good diving right off the beach. While many of the dive sites can be reached by land, some of these entry points require a long walk over coral or a long surface swim. Also, because so much of the island is controlled by U.S. military bases, many of the dive sites are accessed by land through the military bases. Double Reef: 16 to 190ft with visibility from 30 to 90ft. Access via boat (approx 30 mins). Best time is Dec to April; there can be strong currents. There is a drop-off to 90ft and then a second to 190ft+. Coral is in good condition, especially the sea whips and there is a good selection of fish life to observe, including jacks, barracuda and turtles. Apra Harbour. 16 to 130ft with visibility from 30 to 60ft. Access via boat (approx 10 mins). Best time is Dec to April. There are several dive spots here: Gab Gab 2 - A popular site where the reef is in decent condition. You can find batfish, jacks, octopus and turtles here. Blue Hole. 55 to 330ft with visibility 100ft and more. Access via boat (approx. 15 mins). Moderate to strong currents. 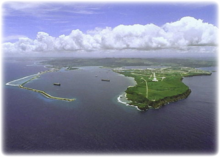 The most famous site on Guam and the one everyone wants to visit. Located off Orote Point, which is the southern spur of land at the entrance to Apra Harbour, it is a natural limestone shaft that descends into the reef. The opening is huge, at a depth of 55ft and once inside, the shaft drops to 330ft+. The first exit hole is at 130ft, so it's vital that you check your descent rate and depth continuously. There is another exit much further down, but only the most experienced will be able to make it to this depth. The whole structure is made up of coral, so fish life is profuse and you can expect to encounter eels, smaller reef fish and naturally a great variety of soft and hard corals. Larger pelagics can be seen in the depths and outside. Tokai Maru. The Tokai Maru was a Japanese passenger-cargo freighter put in service in August, 1930. 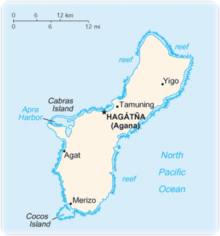 In 1943 Us subs fired torpedoes at the vessel and sunk it in Apra Harbour, Guam. The ship is over 440ft long in 120 ft depths with an 85 degree list to port. The shallowest part of the ship is the upper forward bridge area at a depth of 43 ft. The upper main deck areas are between 55 and 70ft. Visibility averages 20-50', but can vary due to the tide and large ship traffic in the harbor. A good average diving depth to see all of the Tokai would be 60-80 feet. Fishing is one of the main tourist attractions to the island. Fishing here is especially bountiful as the island is located near the Marianas Trench, the deepest section of ocean in the world and home to an incredibly diverse and plentiful group of fish. The trench has a maximum depth of about 6.8 miles, and the deepest location on the surface of the Earth's crust. 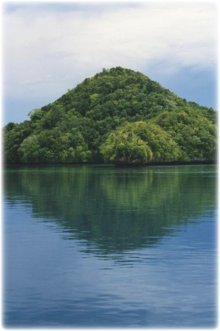 These fishing grounds are home to over 700 species of marine sea life, which are edible by the Marianas Islanders. Fish of variety, shapes, colors and sizes are taken in moderation without waste for the villagers' consumption. There is no fishing license required to fish in Guam at any time during the year. If you plan to engage in deep sea fishing you will likely use fishing charters, who will know of any specific regulations. Tumon Bay and Apra Harbor are the two most popular places for fishing in Guam. Tumon Bay offers gentle waters and plenty of fish, while the deep waters near Apra Harbor make fishing an exceptional experience throughout the year. Average boat charter prices for a full day of fishing (up to 4 people) will be $450 to $500. This will include all equipment and usually hotel pick up as well. While fishing, you may even spot some Killer Whales, Pilot whales, Dolphins, Sperm whales, Melon-headed whales and Humpbacks.